Mervyn Cole and his partner Terry Chappell have moved 14 times in 30 years, renovating properties and then moving on to their next project. However, while searching for their latest challenge, they had to look further afield to find what they wanted. Unfortunately for the couple, the two barns went to auction under sealed bids – and they lost out to a higher bidder. Five months later, Mervyn and Terry discovered that the rival bidders had dropped out of the sale and were asked if they were still interested in the barns. The two 19th-century barns – one made of stone and the other of brick – formed an L-shape, although they were not actually linked. The single-storey brick barn was in a dilapidated state and uninhabitable with large cracks in the walls, which made it structurally unsafe. The stone-built barn lacked foundations and part of it was still very much the original cattle shed, with brick cobbles on the floor and cattle mangers fitted along one of the walls. The two barns came with approved planning permission to convert them into a four-bedroom property. However, Mervyn and Terry were not happy with the proposed design and set about planning a more contemporary style. 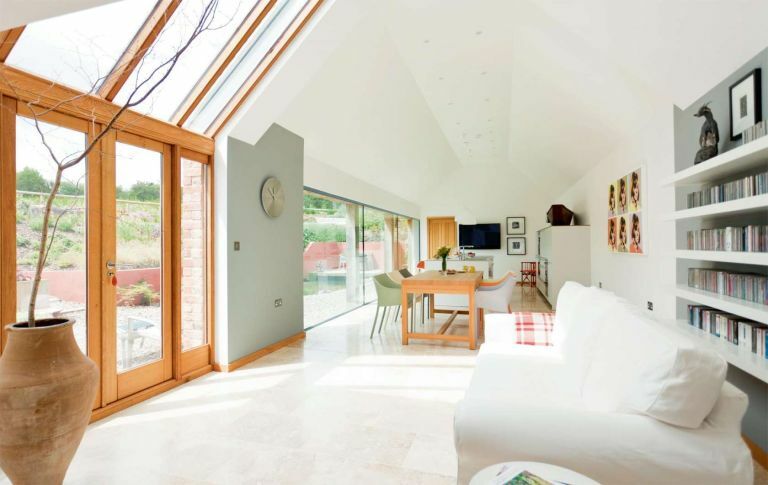 Their design linked the two barns with a glass and zinc-roofed extension and included a ground source heat pump to provide underfloor heating for both floor levels. Mervyn and Terry’s plans for the second floor of the stone barn included two spacious bedrooms, both with en suite shower rooms. The ground floor of the barn would comprise the hallway, study, snug room, shower room and guest bedroom, making it a three-bedroom property. The stone barn would then be connected from the sitting room to the brick barn via the glass and zinc extension. ‘We called in an architect to draw up our designs and to handle the technical details and, two months later, planning permission came through,’ says Mervyn. The build project was scheduled to last for nine months, so the couple rented a property until they moved in seven months after the majority of the building work was complete, so they could make the final decisions on the room schemes. ‘We chose a Bulthaup kitchen, which came from Hobson’s Choice in Swindon, because we fell in love with its clean, geometric lines,’ says Mervyn. The couple then had limestone tiles laid throughout the ground floor to create a neutral base within the rooms and to continue the contemporary scheme. Mervyn and Terry have subtly blended contemporary furniture with the occasional statement piece such as the framed antique Persian jewellery close to the modern Andy Warhol prints of singer Dusty Springfield. ‘We love our new house because we’ve brought together all the best design elements from our previous homes into a traditional-style setting,’ says Mervyn.